Caroline Mastny, 99, of Schuyler, died Tuesday, February 20, 2018 at the Schuyler Care and Rehabilitation Center in Schuyler. Monday, February 26, 2018 11:00 a.m.
Caroline Mastny was born May 22, 1918 at home in North Bend, Nebraska to John and Lilly (Beznoska) Tomasek. She married Louis Mastny February 14, 1946. They later divorced and Caroline moved to Schuyler in 1979. 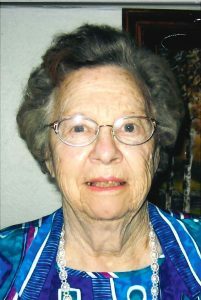 She was a member of the United Methodist Church in Schuyler. Caroline enjoyed cooking, baking and taking care of her flowers and garden. She is survived by nephews: Randy (Sharon) Tomasek of Schuyler, Richard (Marci) Tomasek of Craig, Steven (Billy) Tomasek of Hordville. Nieces Jeannie (Ron) Marquardt of Arlington, Victoria Tomasek of Florida. Sister-in-law Virginia Tomasek of North Bend. Nine great nephews and three great nieces. She was preceded in death by her parents, 2 brothers Leland and Leonard, nephew Garry Tomasek, sister-in-law Jeannette Tank.